“If you can’t take the heat, stay off the golf course” - not a problem with the Puma Soft Stripe polo. 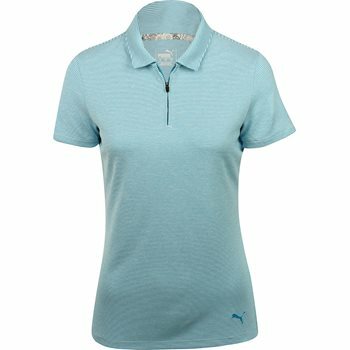 The polo offers moisture wicking technology that keeps the skin cool and dry when sweating occurs. The fabric is easy to care for. It is durable, machine washable and resistant to shrinking and wrinkles. Design details include double knit construction, all over subtle stripe detailing, a zip placket, and a Puma cat at the left hem.